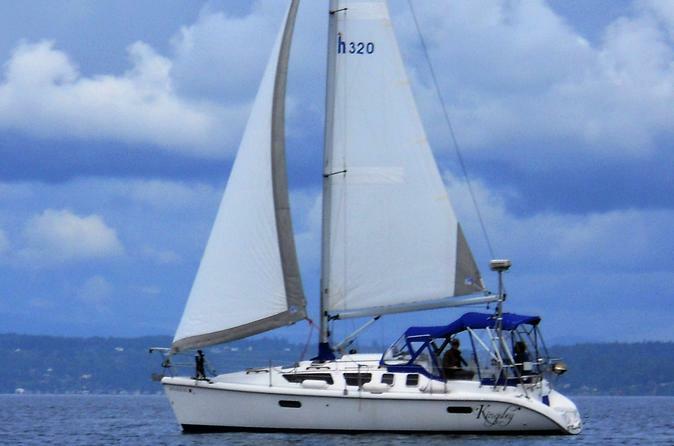 Discover the beauty and joy that is Seattle during this private 3-hour sailing trip in the Puget Sound. The adventure begins as we embark from the Shilshole Bay Marina, preparing to set sail as we round the break water. Enjoy amazing views of the Seattle skyline and the privacy of having the boat to yourself. Throughout the trip you'll have an opportunity to learn how to sail, or just let us do the work and relax. Your 3-hour tour begins at the Shilshole Bay Marina, where you’ll meet your captain for the day at the gate leading to the dock. Check out the nearby convenience store for any last minute necessities (sunscreen, water or snacks) before boarding the boat and motoring out of the marina. Marvel at the massive sailboats and yachts nearby or look for harbor seals and birds while heading out to the Sound. The friendly, professional captain will explain the sailing equipment and boat procedure as the boat gets ready to set sail. The direction of the wind will determine which way the boat ultimately goes, but the views are stunning in all directions. Snap photos of the Seattle skyline, Mt. Rainier and the Olympic Mountains while sailing along. Look for the Space Needle, The Great Wheel, Downtown Seattle and the gigantic Merchant Marine Containerships that travel in and out of the harbor. Wildlife are often present, so look out for seals, sea lions, dolphins, fish and Orca and Humpback whales, which occasionally make an appearance.